The exciting three-stone engagement ring is typically comprised of a center-mounted stone of a larger size and greater height than two flanking stones positioned on the sides, or “shoulders” of the ring shank. The center stone is traditionally a diamond cut into a round shape, but may be rectangular, square or oval. The two flanking stones can be round, rectangular, square, oval, triangular, heart, cat’s-eye or teardrop-shaped and of the same or a different type than the main stone. What style of three-stone engagement ring to choose? Different ring styles will suit women of different personalities. By asking questions, getting feedback and listening to the special lady’s perspective of the type of rings she likes, choosing a ring she’ll fall in love with should be easy. Making a choice from the vast selection of rings available is difficult enough. Information about her tastes always translates into easier decision-making when the time comes to purchase.The simplest course is to take her window shopping. Find a mall with retail diamond jewelry on display, and devise a “chance” moment to let her eye the items there. Most women will let it be known what style of ring captures her eye and imagination. Don’t give away secret intentions, though. Women delight in the surprise of a formal proposal, complete with the gift of a tasteful, thoughtfully-chosen and attention-grabbing ring. The Romantic loves flowers and soft fabrics, summer days and diffused, curvy ring designs. Stay away from high central mounts and opt for lower, fluid designs, perhaps with the ring settings made of yellow or rose gold channels filled with small diamonds. The Artisan is attracted to unique shapes, colors and styles. She would be delighted with bold, sweeping lines as well as colored diamonds or semi-precious stones. The Trendsetter tends to like large stones set in chunky, polished rings and airy settings showcasing three large matching diamonds of equal size. The Historian is often drawn to the use of multiple metals, with artfully colorful small-stone settings and flowery, antique-looking filigreed metalwork. Besides selecting the perfect ring to suit her tastes and personality, it is likewise important to select an attractive style to flatter her hand and finger shaping. The rule of thumb is to choose a thinner band and an elongated center stone such as an oval or Marquis cut for women who have shorter, wider fingers. Women with long, slender fingers can wear wider bands set with chunkier stones and rings with fussier embellishments. Don’t know what size she wears? Ask her to let you look at the “details” of one of her favorite rings that fits her well. Rather than asking her what size it is, casually slip it over one of your own fingers. Just remember to use that finger for ordering the proper size when visiting the jeweler. How Much Will a Three Stone Engagement Ring Cost? The choice of metals used in a ring should be considered with an eye toward beauty, color preference, metal strength and longevity. In addition to traditional diamonds, a limitless number of combinations exist in three-stone engagement rings that also effect price. Stone-enhanced settings made of diamonds will raise the price of the ring, while pairing traditional diamonds with semi-precious stones such as sapphires, rubies, aquamarine, Citroen, or amethyst can lower the cost. Choosing artificial diamonds or man-made semi-precious stones will significantly lower the price tag for those with a modest budget, as will metals with higher alloy content. A ring is only as good as the method the designer uses to attach the stones to the ring. More than one hapless bride has discovered missing stones, when settings failed to secure stones properly. Many retail jewelers offer protection guarantees against stone loss, and prove to be well worth the investment in peace of mind. When choosing stone mounts, they should not be sharp, snag on clothing or stand too tall above the hand. What’s the Best Source for 3 Stone Engagement Rings? Art Carved 3-stone engagement rings are available in traditional styles, perfect for the Traditional girl with simple tastes who would be pleased with a classic, quality ring. Their three-stone Palladium rings run from $2250 for a .38 TW diamond ring to $3690 for .75 TW. Scott Kay offers rings that are simple, light and delicate. His designs are a good fit for women with small hands and a distinctly feminine side who can appreciate classic styling and good looks. Scott Kay three-stone engagement ring designs hover in the $2000 to $3000 range. For the Romantic girl, TACORI offers unique setting styles, incorporating tulip-like blossoms or raised crowns of diamonds to secure the main stone. They offer a three-stone diamond ring with sapphires set in the shoulders for around $4000. Mark Silverstein brings unique twisted metal bands that capture the light together with beautiful stones in a variety of settings. He also offers a main diamond design teamed up with sapphires on the shoulders, tucked between two channel-set diamond arches for $4680. UNEEK Designer provides a sharp two-tone white and rose gold 18K three-stone diamond engagement ring with one large and two small diamonds circled with smaller channel-set stones. A total weight of 1.89, this beautiful ring is sure to impress the discriminating lady for a mere $9995. UNEEK also sports a Platinum and 18K yellow gold three-stone engagement ring totaling .71 CT for $8432. The main stone is set in gleaming yellow gold contrasted with the bright glitter of a Platinum shank and shoulder settings, offering a beautifully elegant, traditional ring with a distinct, modern punch. Verragio jewelry designs are also available through ARTHUR Jewelers, or can be accessed via on-line brochures and Verragio storefront locations. Touting the worlds most comfortable rings, Verragio adds unique carving and beading into the inner surfaces of the shank to keep the ring upright and discourage spinning. An important factor for rings with cluster settings that tend to be top-heavy, any design that provides a method to overcome the tendency of rings to turn toward the palm is a definite plus. Verragio uses their signature Lumino settings in the PARADISIO collection of three-stone engagement rings. The Lumino setting allows for 75% more light to be captured by the stones, resulting in a higher degree of sparkle and fire than regular mounts can offer. High reflection and comfortable fit make a Verragio ring a delight for the woman who likes anything from bold statements to lacy, filigreed settings in a ring whose brilliance can sparkle across a room. Verragio designs range from $1500 to $7000 for settings in 18K gold. Cash is the easiest and cheapest way to make a ring purchase, because there’s no interest to pay. You can take your purchase with you the same day, and never worry about bills to pay later. It’s also possible to negotiate a discount for paying cash with many retailers — the key is to ask. Saving up for a cash purchase in advance is always the best way to get the best deals. Lay-away plans usually require no fees or interest charges by simply make payments to the retailer until the purchase price is paid in full. This is generally required before taking actual possession of the ring, however. 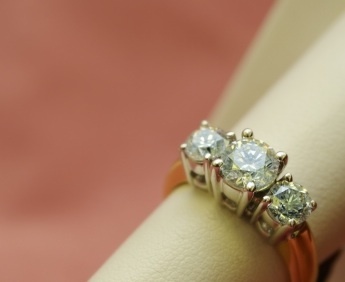 Jewelers may offer in-house financing. Since interest rates can vary, compare retailers for choosing the best rates and plans. Personal Bank Loans are another place to turn for a loan, provided a good reputation with your personal banker exists. Minimum loan amounts usually apply. Credit Union Loans typically ask for lower interest rates than commercial banks, though they often require an association membership. Consumer Credit Lenders, like CitiFinancial and Wells Fargo exist nationwide, offering credit programs that often ask the highest interest rates, adding substantially to the cost of a ring purchase. Most jewelers also accept credit cards. Plan on investing the equivalent of two months’ salary for a proper engagement ring. That equates to one week’s pay saved over eight months, or two weeks’ pay saved over a period of four months. If you know you want to get married someday, start saving for the lucky lady’s engagement ring before you ever meet her. Then you’ll be ready for anything when the opportunity with the right girl makes an appearance in your life. I was wondering, after reading the article, I have a few questions you possibly may be able to help me with. I have been a full-time student for 9 years now (Yes, three semesters a year, for 9 years, ugggh!!) My issue is that I have excessive student loans, and I have found a woman I want to marry. My problem is that we are trying to get married, because we are both very devout christians, and we found that we love each other. Unfortunately, I have not been able to save for a ring, and I need to start saving for a wedding, and honeymoon (as short as one may be) and later when I get a good job I can take her somewhere for a longer time period. Anyway, my question is this, do you know of any websites, or companies, charities, churches, and or other ways, that I may be able to get help purchasing her a decent ring (in the 500-1500.00) area??? I know this may seem like a bizarre request, but I do know that many churches will help their parishoners, however my church is not big enough for this. I was wondering if anyone had ever built a website, where many people could donate 25 cents, or 50 cents and the site would generate a large amount of money strictly for the helping of younger people to get the weddings and engagements that are not lavish, but will make a young bride have something to remember. Nowadays, we focus so much on how much divorce there is, it would be nice to have some site or entity/corporation/charity that helped young and older couples that are not married, wih maybe the engagment ring, and two wedding bands, or with part of the wedding itself, or even a nice dress for the woman. Everything involving a wedding (which is supposed to be the most memorable day of the two people joining as one in Gods eyes, and theirs as well) is so expensive!!!! I just wanted to take a shot in the dark and see if you know of anything or any place I can go that will help me purchase her a decent small diamond on a 14kt solitare setting. We are planning on moving to Brazil for a few years for me to find work as the economy here is so bad, and down there is a bit better (She is from Brazil originally). Thanks in advance for any help you may provide for me on my endeavor of first marriage. PS.- if there is no site such as this, as my major in my Master Degree is MIS, I may have to try to setup a site that may help people with these types of things. Maybe http://www.helpingthemgetmarried.com or something like that, huhh???? ?